An irrigation system requires professional routine maintenance attention a minimum of twice each year. In the fall the system is “winterized” so that freezing (and expanding) water does not damage the system during the cold winter temperatures. A spring “opening” energizes the system with water and allows a professional review of the operation of all major components. If you have an older irrigation system, your drinking water might not be safe. 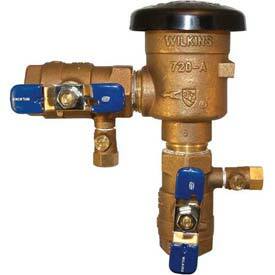 All irrigation systems today are required to have a safety device called a backflow preventor. This device prevents water from the irrigation system, which could be contaminated with animal waste and lawn chemicals, from siphoning or "backflowing" back into the potable (drinking) water supply. Many municipalities have strengthened their code to ensure that safe, quality backflow preventors are installed. This safety matter is so serious that in many communities we are required to hire a licensed plumber to pull a permit and to insure that the correct device is installed and that the backflow device itself is installed properly. It is common to see older irrigation systems with backflow devices that are now considered unsafe. We actually see some installations with no backflow preventor of any type. As a community service we offer a free visual backflow inspection. Call to schedule an appointment today. Thinking of a New Irrigation System This Spring? If you are considering adding or expanding an automatic irrigation system this spring, now is the time to begin planning. Did you know that we do professional CAD (computer aided design) irrigation design? Our professional designs specify all parts and quantities along with the design itself, showing where heads and pipes and valves will be located. If you have a preference for say Rain Bird, Hunter or Toro parts we are qualified to design using your preferred manufacturer. Once you own the design, you can bid the work out to your preferred irrigation installer(s). We, of course, can install what we design and are happy to quote the work for you. But we have discovered that some homeowners prefer having a design that they understand and agree with and to shop the installation cost. What do you get with an irrigation design contract? An initial visit and consultation to review your property and area(s) you would like to irrigate. At this visit we will provide an estimate for your custom design work. We will need a copy of your property plat in order to proceed to the design stage. If we end up doing business together the entire $95.00 consult charge for this visit is deducted from your design contract payment. We identify your water source, pump size, pipe sizes and water pressure. This allows us to calculate how much of your water supply, in GPM that can be reasonably allocated to the irrigation system. That is, we determine how large the zones can be or the maximum amount of water any one zone can use at any one time. A second visit where you and our designer review your preliminary design. Adjustments can be made as needed or desired. Four copies of a final design printed out to scale along with an electronic, scaled pdf file. The final design contains all of the required parts as well as computer calculations establishing that each zone will work properly given your water supply. If you have requested we quote the installation, you will also receive our contract proposal. If you choose us for the installation you may deduct 50% of the design contract cost from your contract payment. In the end you will certainly get at least some of your design costs back in a reduced cost from the installer. After all they will not have to do their own design or do a part takeoff. It is all done for them. In addition the contractor will know you are bidding the project out and the specifications are the same. In the end what will be installed will be according to an approved design. When you get pricing from different irrigation installers you are getting a price for the same installation, “apples to apples” as they say. Call us today for an irrigation design consultation.